The history of the planets is recorded in the rock record. Early in the history of our Solar System, two planets had liquid water on their surfaces and may have had the right conditions for life to form: Earth and Mars. While much of Earth has changed since that time due to plate tectonics, life, warm temperatures, and flowing water, Mars lost its atmosphere, cooled down, and did not have plate tectonics, so much of the surface has remained the same, preserving the rock evidence of the time when Mars was more Earth-like. This is an exciting time for geology because we now have the tools to study the rocks on Mars and understand the environments that persisted early in our Solar System and may have led to the origin of life. My research is focused on observing the textures and chemistry of the sedimentary rocks on Mars to understand the sediments volcanic origin, the processes that broke down the rock fragments and transported them into crater basins, the groundwater that flowed through the sediments to cement them into rock, and any later rock-fracturing or cementing events. I do field work on Earth to better understand the key processes that create and alter rocks where I can study them in-situ, and then apply that understanding to the images and data sent back from Mars spacecraft. I also help operate the spacecraft and contribute to the team decision-making process of selecting what rocks we can analyze that will give the most information about Mars’s past. More detailed descriptions of some of my recent research projects are below. 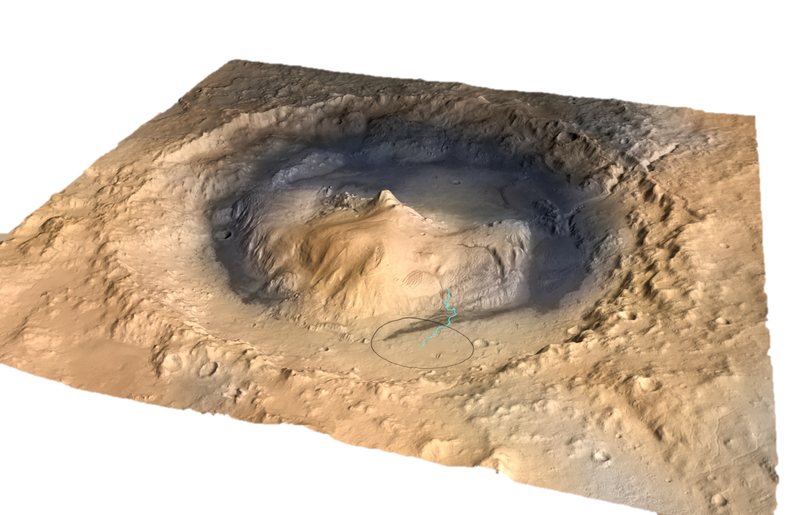 Gale Crater, the landing site for the Mars Science Laboratory mission, was selected because of a 5 km high mountain of layered rocks, called Mount Sharp, which sits in the center of the crater. Based on minerals detected from orbit, Mount Sharp is one of the only stacks of layered rocks on Mars that preserves minerals deposited in each of three major stages of Mars development; the base of the mountain has clays, formed in water, then there are layers rich in salts, likely representing a drying environment, and finally the top is mostly dry rust-colored dust, as much of Mars is covered in today. About 1 km above the current floor of Gale Crater, near the upper part of the “salty” (sulfate-rich) rocks, there are large networks of spiderweb-like light-toned ridges, highlighted by accumulations of dark sand in the hollows. 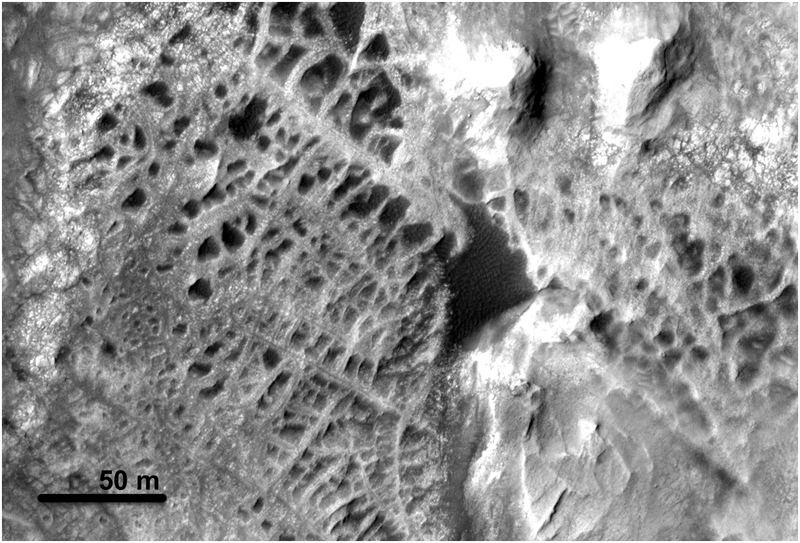 These are called “boxwork” structures, and they have a number of implications for the origin of Mount Sharp. Boxwork structures form when (1) a rock is formed and cemented, (2) the rock unit fractures, perhaps because of pressure under burial or nearby cratering impacts, (3) groundwater flows through the fractures in the rock and evaporates, leaving salty cementing crystal growths that fill the original fracture voids, and (4) the rock is eroded by wind, and the cemented fractures are more resistant to erosion than the original rock, so what you see are the original rock fractures, now in positive relief. The boxwork structures on Mount Sharp have fracture-fills up to 10 meters across, and they cover about one square kilometer of the surface at that elevation. In the published paper, we discuss the formation and implications of the boxwork on Mount Sharp, including calculating the amount of groundwater required to deposit that much salty cement, which is enough to fill at least 168,000 Olympic swimming pools! 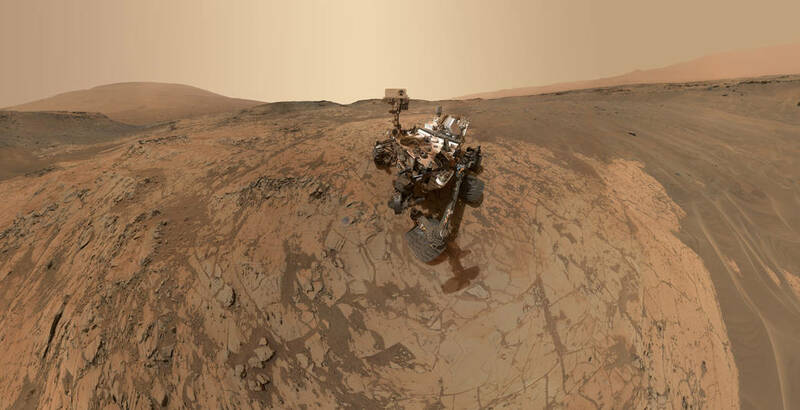 The key result of this work was to show that significant amounts of groundwater were present, high above the current floor of Gale Crater, so Gale Crater was a good selection for the Curiosity rover to investigate the history of water on Mars. After landing in Gale Crater, the Mars Science Laboratory rover, Curiosity, drove about 300 m away from its destination, Mount Sharp, in order to visit the lowest-elevation rock unit in the floor of the crater (because water flows downhill!). 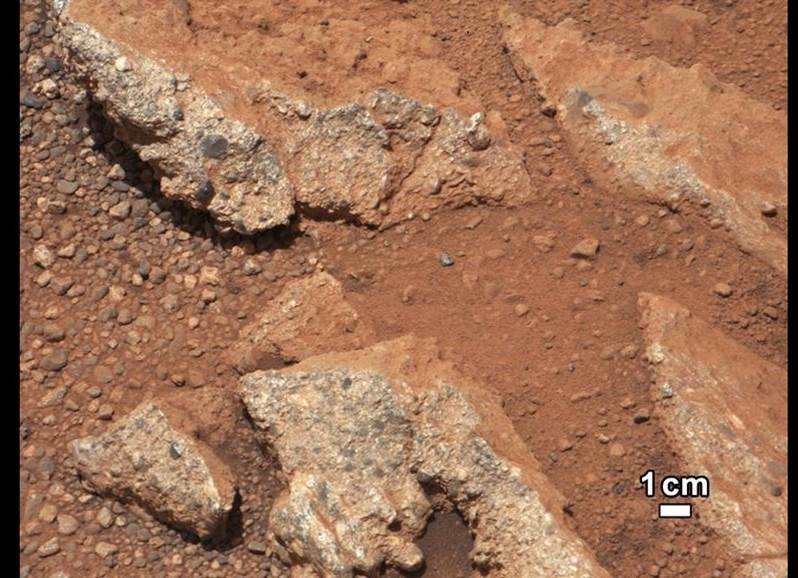 That rock unit turned out to be the first mudstone ever found on Mars, the Sheepbed mudstone, formed in a neutral-pH lake with all of the chemical elements required for life. 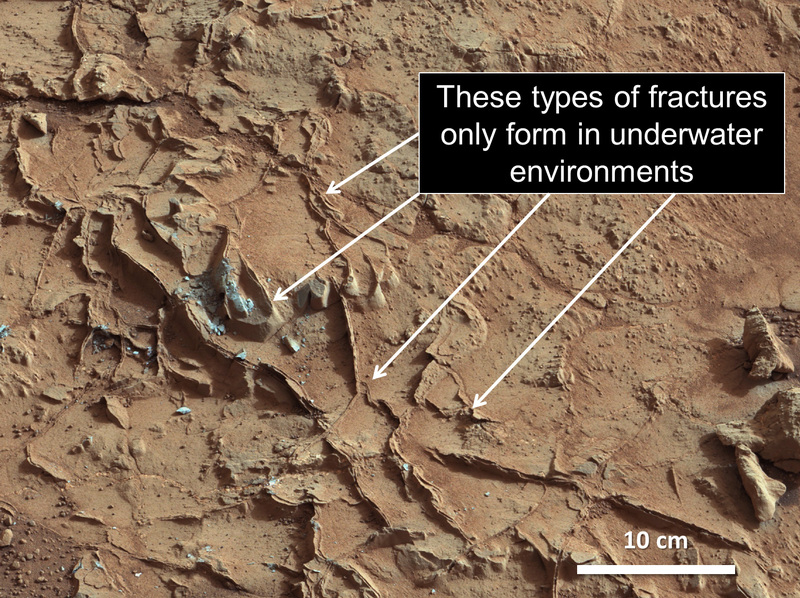 This lakebed mudstone was extensively studied using the cameras and analytical instruments onboard the rover to understand as much as possible about the environment in which it formed. One of the clues about the lakebed environment, reported in our paper (Siebach et al. 2014) came in the form of small 5-50 cm cemented cracks in the mudstone. 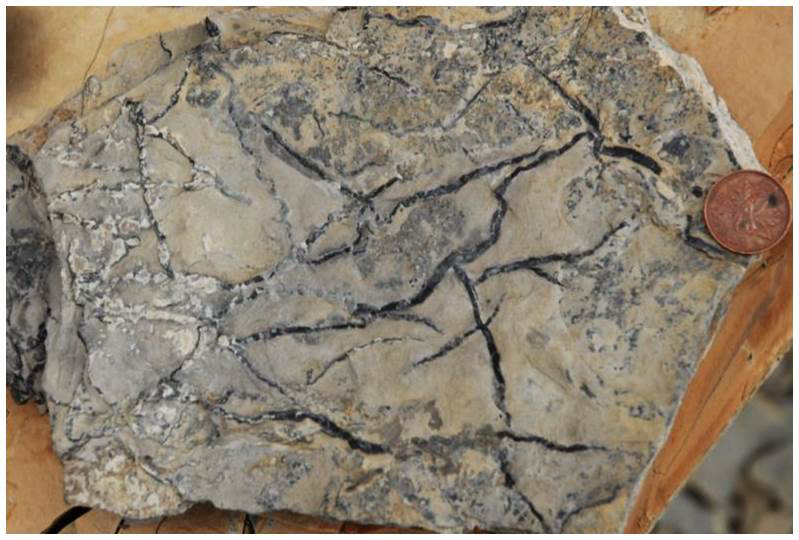 These cracks do not form polygons (like typical desiccation mudcracks), but instead weave through the mudstone in three dimensions, intersecting at arbitrary 3D angles and ending abruptly in spindle points. These mudcracks are not indicative of the lakebed drying out, but they do indicate that the mud contracted, perhaps due to gas pressure or salinity changes in the water, opening gaps in the mud just beneath the surface which then filled with cement precipitating out of the water. These are called synaeresis cracks, and they form on Earth as well, but they are mostly only preserved on Earth in deposits that formed before the development of burrowing organisms that disturb these delicate cracks in the mud (e.g. “Molar Tooth” structures). The presence of these cracks supports the interpretation that the Sheepbed mudstone formed in a lake that was stable (full of water) for significant periods of time, likely hundreds to thousands of years. Sedimentary rocks, such as mudstones, sandstones, and conglomerates, form when accumulations of rock fragments broken from source rocks collect in a basin and are cemented together by compaction (heat and pressure) and water-deposited cements. These rock-forming processes all affect the composition of the final sedimentary rock; the final rock chemistry reflects (a) the composition of the rock fragments that were eroded, (b) any sorting of those initial rock fragments by size, shape, or density during transport into the basin, and (c) the chemistry of any added cementing materials. On Earth, we disentangle these effects by using high resolution microscopes to see individual grains in the rock, to assess the chemistry of the rock fragments separately from cements. On Mars, we do not have this capability but we can still learn something about the chemistry of each component by assessing a wide variety of samples in the same basin. While the Curiosity rover drove across the floor of Gale Crater, or the “Bradbury Group” rocks before reaching Mount Sharp, it analyzed the bulk chemistry of over 100 sedimentary rocks with different elevations, grain sizes, and locations. My current research project is querying this dataset to attempt to constrain the chemistry and characteristics of the original rocks (outside the crater) that were broken up to form these sedimentary rocks and the fluids that cemented the sediments into rock. One of our major findings is that the compositions of the different rock are strongly related to the grain size of the sediment particles, indicating that sorting of the grains by density and size as they traveled into Gale Crater had a significant effect on the chemistries, and this effect has to be accounted for to really understand the composition of the source rocks outside the crater. Home 2019 Kirsten Siebach. Web design by Jeff Siebach.